...may it also find a place in your heart." In summer 2006 Johannes Schmoelling's album Instant City was released on his own label Viktoriapark. In an interview with Paul Lawler, Johannes Schmoelling about this album: "I started in September 2005 with a new set up of computer and software instruments. There was no concept, no influence, only me, stepping each day in my studio, double click on the recording session, which I left yesterday, and the complete set up is for your demand on the screen. You can start working from that point, where you left the session. It's very easy to work with. Then, one day I received a mail from a friend of mine, Peter Uhlig, a musician -- we played in the 70s some sessions together -- and he asked me to join his new gallery page on the web. He had painted for three years now and had put his paintings onto his own web page. From that moment, when I saw his paintings, I felt a very familiar relationship and intention -- what he tried to express with his paintings -- to the music I worked on. And so the idea of Instant City was born. More and more I understood what my music is all about, it's in some ways the approach to my city, in which I have been living for more than 34 years. But in the end Instant City tells about myself, more than any other record I did through my whole life." 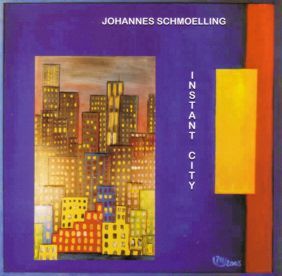 Instant City is Johannes Schmoelling's longest album to date with eleven tracks and a running time of almost 75 minutes. One more composition, that did not fit on the CD, was published by the Dutch e-dition magazine and later re-released on the album Images And Memory.